From "Different Kinds of Dead"
Ed Gorman, a master storyteller, is the beloved author of dozens of mystery novels. This highly-praised collection of short stories includes "Survival," "Masque," "The Second Most Popular" and others. 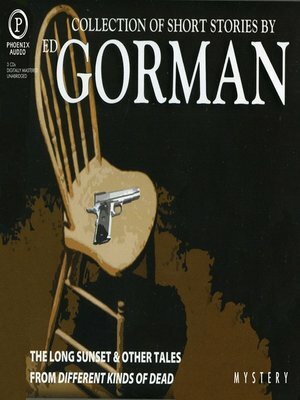 It is a remarkable edition that displays the extraordinary range of storytelling skill and powerful emotions that won Gorman the prized International Fiction award and caused Mystery News to say of his previous collection: "A powerful, disturbing, often poetic collection filled with writing that is a model of clarity and right narrative control." Gorman has also received several awards, including the Shamus Award, the Spur Award and the International Fiction Writers Award for his contribution to the genre.